Bob and Denise Green are wonderful advocates for their son, Anthony, who they call Tony. 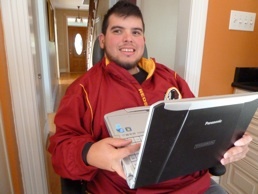 Tony, who lives in Hyattsville, Maryland, is deaf and has cerebral palsy, as well as some visual/perceptual difficulties and learning disabilities. Though he graduated from high school in 2007, Tony has been unable to attend college on a regular basis, receive job training or hold down a job, due to a variety of health-related issues – until now. We at The Eric Fund agreed and were equally eager to inform Tony that he’d been selected to receive the Panasonic “Toughbook” (a durable laptop that can withstand drops and heavy use) and the Harris Communications interactive software that he’d applied for! The software that Tony received is designed specifically for people who are deaf and hard-of-hearing and will enable Tony to interact more easily with the hearing population, which will have a profound impact on Tony’s professional and personal life. The software even allows for translation to Spanish! When we recently spoke with Tony’s dad, Bob, they were together moving through the learning curve associated with the use of any new piece of technology. “Tony absolutely loves the technology,” Bob said.